We went out to lunch and UCLA's Cotsen Institute of Archeology with Mr Protocol. It was a two-fer in that we heard about the state of Egypt's antiquities and politics from both Dr. Zahi Hawass, former minister of antiquities, and El Husseini Abdelwahab, Consul General of Egypt for the US. I'm not an expert on Egyptian politics, but there was much to chew on and think about. It's clear that Morsi and his muslim brotherhood cronies are terrible for Egypt and most Egyptians. The path forward out of this mess is not so clear. But members of Egypt Exploration Organization of Southern California and their guests listened and asked questions. Did the press cover it? Nope. They were too busy covering college football and celebrity twerking. Sigh. It was also a two-fer because the Cotsen resides underneath the Fowler Museum of Cultural History and Iris showed me some things she had learned about silversmithing. It may be a small museum, but we always learn something new each visit. Isn't Iris styling? I make the separates, but she decides how to put them together. I had envisioned the sage/light olive top with navy, black or dark olive. She paired it with bright colors to great effect. On a .hot. 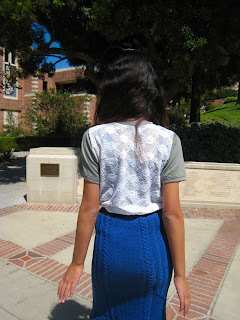 and muggy day, she layered the lace-back T over a long purple tank and then tucked them into a cotton/acrylic cable knit skirt lined in polyester. She does suffer for fashion. I love the detailing on Annie Modesitt's Affair to Remember skirt. I've knit this three times, once for me, twice for Iris. On another day, I snapped this picture of the shirt in an untucked and belted state so you can see the curved back hem. I can tell she loves it because this shirt gets worn as soon as it gets out of the laundry. BTW, I used trusty and reliable Kwik Sew 2555 yet again. This time, I followed their instructions for the picot bands at the sleeve hems and neckline. I omitted the last step, adding the picot stitching, because I prefer the clean look of the plain bands. But, the hem came out so even and softly padded that it was a marvel to behold. I ended up using that finish on the other 7 shirts I made last week. The Kwik Sew pattern illustrations and photos are not very inspiring or fashion-forward. But, KS puts their resources into good fit, accurate pattern drafting, and excellent instructions. They are such a good value because all sizes come in each envelope. You can reuse patterns over and over, for different people, or as your child grows. Once you give KS a try, you'll become a fan, too. 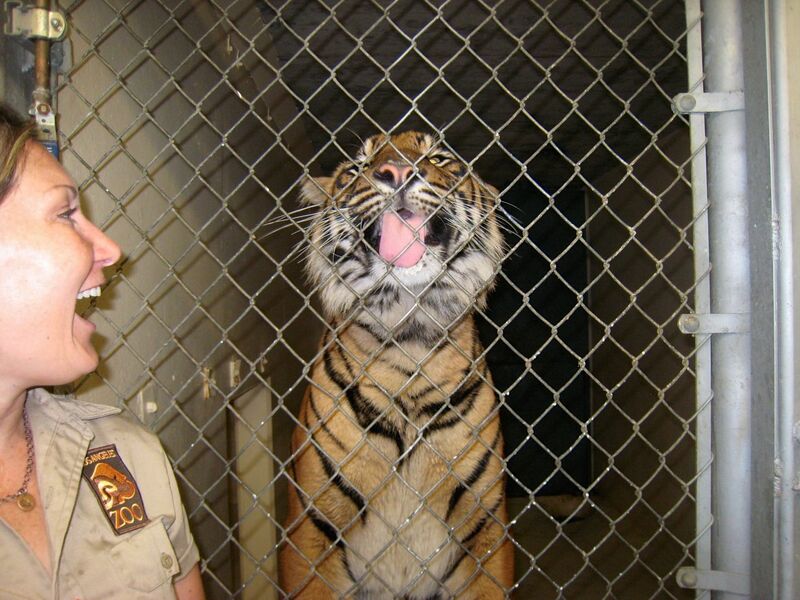 Do not chase wildlife, marine or terrestrial. 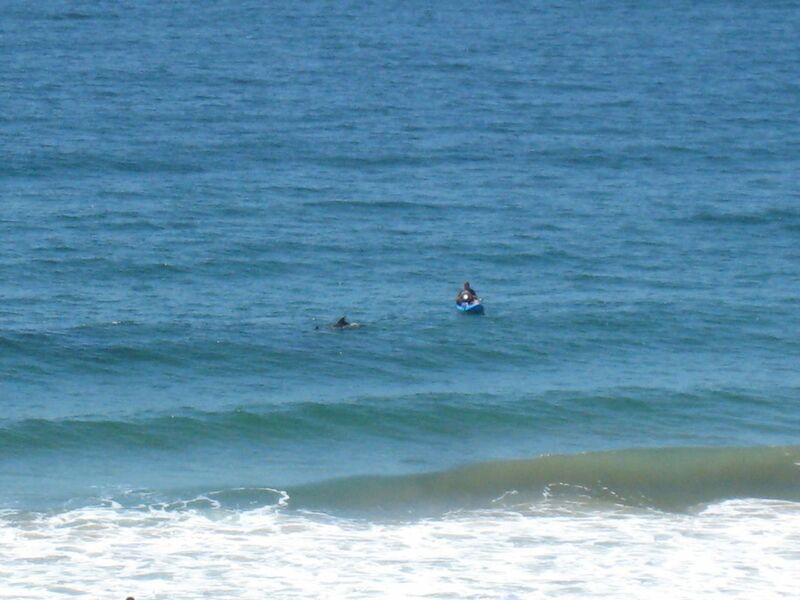 See this guy in the kayak? 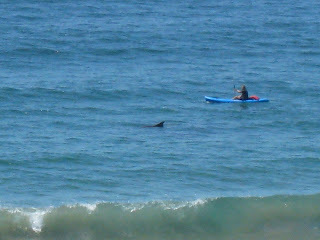 He kept paddling right alongside the pod of dolphins. Still there, only now right in front of the life guard station. Life guards have radios and can report violators. 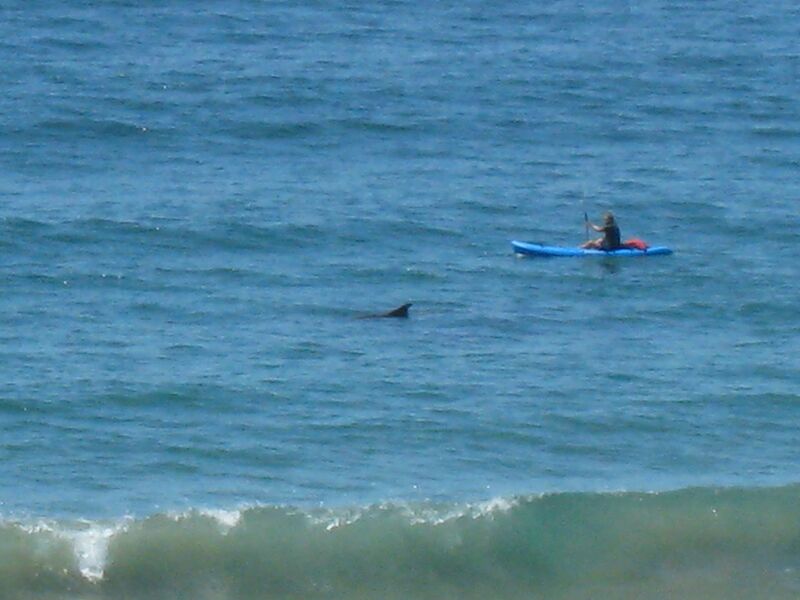 The dolphins kept swimming away and this kayaker kept chasing them. 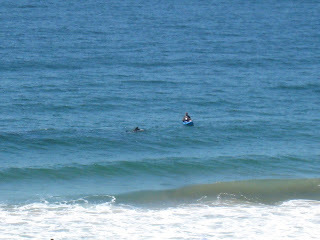 Dolphins come this close to shore for two main reasons, to feed or to rest. This guy was preventing them from doing either. 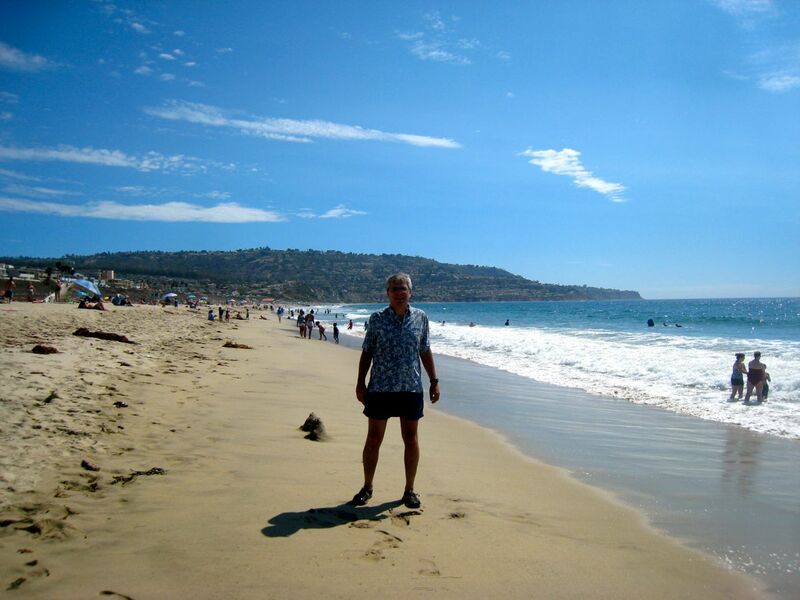 Bad Dad and I spent a lazy afternoon lunching at Zazou and walking on the beach. Have a great long weekend! I hear and read much about the competition for eyeballs to view advertising. Does anyone else feel icky about being reduced to body parts? I'd like to suggest a couple of rewarding and ad-free ways to spend time on the internet. However, these will take some cognitive work. Firstly, don't let the name of the course, Writing in the Sciences, put you off. This course will help you right more clearly and quickly about any subject. You need to take this class. Seriously. The instructor, Kristin Sainani, is justly famous for her teaching and editing prowess. Even if you don't have time to do the writing and peer editing exercises, enroll and listen to her lectures. I felt it was time to brush up on calculus so I signed up for Calculus One. It's structured very similarly to "self-paced calculus", which was offered at University of Colorado at Boulder (CU) when I was a graduate student there in the 1990s, and is just what I was looking for. But, it may not work for someone who is learning calculus for the first time and completely on their own. College department funding is often tied to the number of students majoring in their subject. Some departments also need to teach "service" classes to students in other majors. E.g. physics majors need to take math classes, chemistry students need to take math and physics classes, and biology students need to take math, physics and chemistry classes. Who pays for the service courses? There is much interdepartmental fighting over resources, which are always too scarce for the number of students that need to be taught. That's how I ended up teaching three .different. classes one semester for $800/month and completely burned out on teaching. Service classes are chronically underfunded and CU came up with a creative and cheap response for calculus. Self-paced students used the same textbook as the traditional calculus students and were expected to master the same material. However, they didn't attend traditional lectures because there weren't enough seats in the lecture hall. Instead, they went to a math lab staffed with at least one teaching assistant (open days, evenings and weekends) and equipped with computers that offered up practice questions (and answers). Students could do as many or as few practice problems as they liked on their own (in the math lab or elsewhere), but they needed to come into the math lab to take unit quizzes. After a set number of units, they took a mid-term. If they passed that, they earned one unit of calculus credit. One of my chemistry students told me that, since she was a returning student and had taken calculus decades ago, self-paced was perfect. She breezed through the class in the first 5 weeks of the semester, before her other classes got serious. Then, she could focus on 3 classes instead of 4 for the rest of the semester. Another student recovering from a head injury (car accident), took 1-2 units of calculus per semester until she finally finished the required 8 (or was it 10?) units. Yet another student said that he worked intensively on self-paced calculus when the skiing was bad and then ignored it when the snow was good. So he got ahead in the fall, fell behind in the winter, and caught up again in the spring. All three styles/strategies were successful in that they learned and retained enough math to pass quantum mechanics (which I taught at the time). Students are charged only for the number of units that they passed, taking the financial pressure off. In a traditional class, students are charged for all classes (after the final drop date), regardless of whether they pass or even complete the classes. The TAs in the math lab proctored exams and tutored students face-to-face (F2F). I think that the F2F contact is vital for keeping students engaged when the going gets rough. I haven't figured out a better way to discern which concepts students are having difficulty grasping besides working F2F one-on-one or in small groups. In a MOOC, students can replay a lecture segment ad nauseum, but a F2F tutor can change tack and come from a different direction when they see one approach isn't working. Or they can diagnose what foundational understanding is missing and send the student back to learn the prerequisite(s). F2F time is expensive and necessarily needs to be rationed in a public university. Self-paced math was a good way to do it. I wish Calculus One was available when I was learning calculus. The lecture segments are so good--clear, yet also (mathematically) rigorous. They aim to demystify calculus for new initiates, yet lay the foundation for more formal math analysis later on. It's a seriously great use of MOOCs. My only hesitation is that one really needs a F2F teacher to explain the whys and wherefores when students get stuck. If you have a friend or a tutor who can help you get unstuck, Calculus One is perfect. If you teach math, you may want to sign up and witness some seriously great teaching. I'm stewing a little bit--okay, a lot--about the downside of school choice. Ask anyone if parents should be able to select the schooling that is appropriate for their child and nearly everyone will answer yes. But, what about the schools that have to adjust to swift changes in parental sentiment? 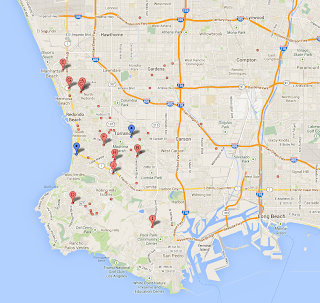 In the beach cities, some neighborhoods are zoned to go to school A, others to school B. Some areas can select either A or B. We didn't bother to visit or register for school A because our daughter's middle school automatically feeds into school B. Some families register for both schools because they can, and then decide the first week of school. 730 students enrolled for 600 Freshman spots, which might have been OK, except that fashion is fickle and nearly all of them selected school B. My kid is sitting in classrooms with 40 students when the school was aiming for 30-35. This is like making restaurant reservations at several restaurants and deciding on the fly which place to dine and which places to blow off. Only this has more lasting consequences. Maybe we should have been bad (savvy?) players, registered at both schools and picked the school with the fewest students per classroom? May I digress a little bit and discuss intra-district transfers? In this area, it is acceptable to say you want to attend a different high school because you seek a specific foreign language that your home school doesn't offer. For instance, our home district school offers Mandarin (both traditional and simplified) in addition to the standard Spanish and French. School A offers Spanish, French and Latin. Another nearby district's school offers Spanish, French, Japanese and Korean. Poorer schools sometimes can offer nothing but Spanish. Hmm, do you think a school's selection of which foreign language(s) to offer is based on the type of students and families they wish to attract? How will this play out in the standardized test score game? This is serious business because foreign language teachers are often paid not by the state/district, but by parental fund-raising and private foundations. I was livid when I found myself waiting in line at registration with half a soccer team from 15 miles away. The soccer coach had asked the school to give them intra-district transfers so she could have ringers for the team. I'm generally fine with the idea of accepting students who live perhaps a mile or two outside the district boundary or started here and moved outside the district. Accepting 9th graders from so far away, and who have no history in our community, when the classrooms are already crowded, stretched my idea of hospitality. What about the local girls who won't get to play soccer because the team was packed with out of town ringers? My response gave me pause. Why does this bother me so much, when I am so fond of the (mostly) immigrant kids that I tutored last year? They are still kids, but I am certain most of them are going to be great additions to team USA. So why can't I muster up some hospitality and give the same welcome to the soccer players fleeing LAUSD? 4 girls, three day sleepover. Sewed 8 knit tops in 3 days--10 yards and 3 Ts from the refashioning pile out of the sewing room. 3 of the 4 girls helped. Guess which one didn't. I've learned to thread the Pfaff serger in < 10 minutes and my times are still decreasing. One girl collected. Two more will be collected tonight. Consoling 4 best friends going off to 3 schools in 2 states. Identical twin shirts to confuse teachers on the first day of school . One twin is a righty, the other is a lefty for perfect mirror images. Now, if only I can remember which one is the lefty. Should be taking the Stat2.3x final today. In a sample of 4 girls, 2 are left-handed. Can you test the null hypothesis that the prevalence of left-handedness is 10%? If so, which test would you run? What is the p-value? STAR test scores (California standardized school tests) recently arrived in parents' mailboxes. Anxious parents trying to enroll their kids in a .good. school are flooding the server connected to the STAR test score search portal. I have previously written much about the things that STAR tests can and cannot tell you about a school. Schools and teachers unions say that they feel like scapegoats because they are held solely accountable for students' learning (as evidenced by standardized test scores) when they cannot control what happens outside the classroom. They have a good point. I've become intimately aware of this problem because I spent last year as a volunteer math tutor at a Title I school 3 days a week. See digression at the bottom. Wealthy areas have higher test scores than poor ones. Obviously, that must mean that they have better teachers. Perhaps you are broadminded and you think that they also have better parents. Well, I think that rich people differ from poor people in one important way: they have more money. Tutoring centers fall below many people's radars. I searched with Google by typing "tutoring centers in [my zip code]". Try it with your own zip code. In wealthy areas, people pay $50-$150/hour for private one-on-one tutoring for their children. Search for news stories using keywords tutoring+wealthy and you will read eye-popping stories. The merely upper middle class send their kids to tutoring centers, where their kids are taught in small groups, arranged by ability level rather than chronological ages (as in public schools). 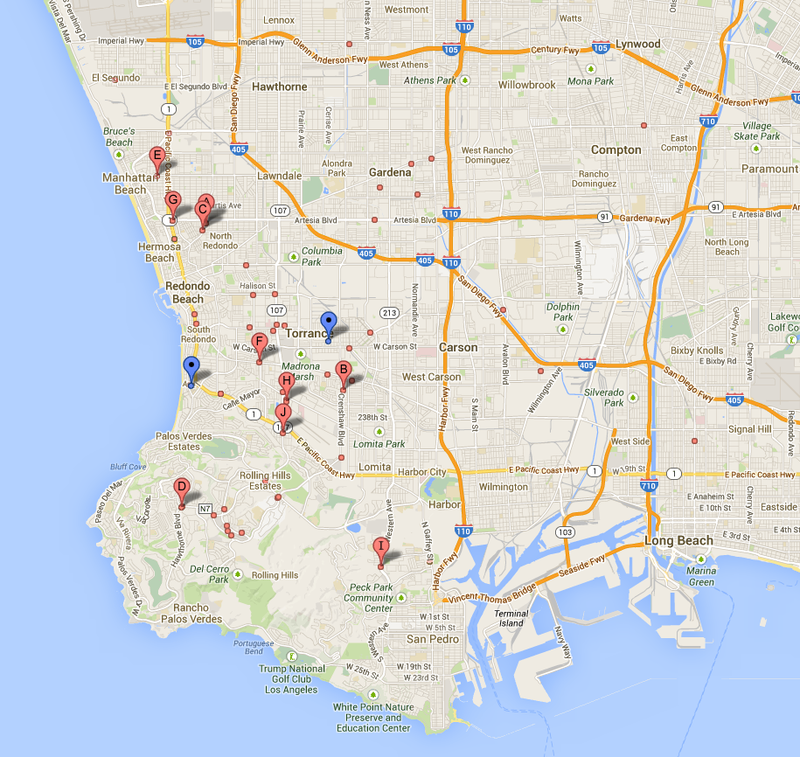 When I searched for tutoring centers in my area, I saw that the red dots fall mainly outside of my zip code. There are two in my zip code, but they are on the periphery, across the street from wealthier cities' schools. 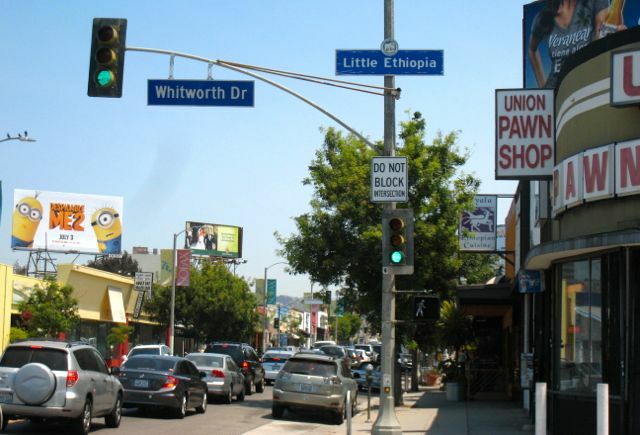 Notice how few of them locate in south-central Los Angeles. Tutoring centers follow the money but public school systems cannot. They need to be where the kids are. One tutor who works both privately (she charges $30-$50/hour) and in tutoring centers (paid less but the work is steadier) says that her tutoring center students are almost entirely Asian and that their parents pay for tutoring in every subject. If they have multiple kids, parents could spend as much for after school tutoring as for rent. This is the "miracle" behind a south bay school district that packs 40-45 students in each classroom and still manages to obtain enviable STAR test scores. Forget tiger mom and sign your kids up for one of these! Or maybe not. The tutor says that the kids she teaches are mostly incurious and only want to get high test scores so that their parents don't jump on them. That's not a recipe for fostering family bonding or a lifelong love of learning. She feels sorry for the kids. The websites of these tutoring centers make for good sociological study. They invoke Harvard, Yale and the ivy league in their names and literature. The ivy league .together. admit fewer kids than just one typical state university. Very few kids will be admitted to them because there is not enough room. Is every kid that doesn't go to the ivy league a failure? Whose failure is it? The kids for not being incredible enough (on paper)? The parents because they couldn't afford it? Or their culture for having such a narrow definition of success? Did you know that public (usually state) universities educate 95% of American college graduates? Here's one school that markets to the Korean community. Notice that they explain that their name, Veritas, is the motto for Harvard and part of the motto for Yale. Another school marketing toward the Chinese community offers Mandarin classes as well. They call themselves "Ivy League School". Another popular area tutoring center names themselves after a scientist. Take a look at their rate schedule (typical for this area) and multiply by 2-3 kids. Bad dad says that these elementary school standardized tests don't matter to kids' futures at all. I disagree. The reason that these tutoring centers spend so much time preparing elementary age kids for them is because they determine whether you get into GATE and honors classes. Those classes then funnel into AP classes. Unless you take AP classes and get that one grade point bump in your GPA, it is numerically impossible to get into one of the competitive UC campuses. While the top 10-15% of CA HS seniors are guaranteed entrance to the UC system, a greater than 4.0, straight As in normal classes, is required for the most desired campuses of UCB, UCLA, UCSD. Due to state and federal budget cuts, the school district did not have funding for "homework club", an after school program where kids could come for help with school coursework. When funding was available, the school paid teachers to stay after school 4 days a week (1 each for math/science and English/history and one for remedial students). 3 teachers, 4 days a week, or 12 hours of funding a week. Teachers who volunteered were assigned 1-2 hours per week. Anyway, that was in the past. Now the schools have no money and they have to beg for help for their kids. Not every Title I school has a mother with a PhD in science (and a BA in math) who was conveniently laid off at the same time that school funding was cut. But there I was, and the assistant principal is a master of getting squeezing blood out of turnips to get her kids what they need. I have a lot more to say about that experience, but will save it for another day. Tyler Green has been active in reporting about the situation in Detroit. He has designated today A Day for Detroit. Each hour, he will blog one piece of artwork that could be lost to the public if the Detroit Institute of Arts' collection is auctioned off by Christie's to pay Detroit's creditors. You can read more at the DFP. 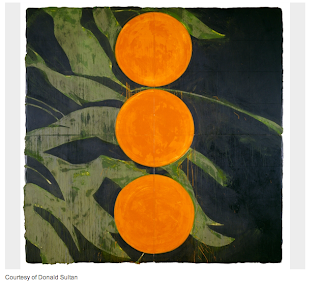 WTF, it's not even clear that Detroit has ownership of the works at DIA. Tyler is encouraging others to blog about their favorite pieces of art at DIA. How to choose? There are so many good ones. I don't have much time this week, but I just want to show you this wonderful work by Donald Sultan, Oranges on a branch March 14, 1992. Please click through to enjoy it in gloriously high resolution. Join the DIA. Join at the Affiliate level for just $180 and you gain reciprocal admission to hundreds of north American museums including dozens in California. It's a great deal, tax deductible, and will help a city in crisis save their patrimony from vultures and looters. To quote Tyler Green, "If you live in Michigan, tell your elected officials that the future of Detroit is important to you and that you don’t support a fire sale of the city’s future." Please, please, please, pay attention to the stories about museum "deaccessioning" in Detroit and around the country. This is a breach of trust to donors and a looting of the public patrimony. Scheduling a get together with Jilly Be and Shams that works for all three of our busy schedules and minimizes contact with one of the largest music festivals in the country proved to be a game of space-time Tetris (a game where you try to fit a bunch of puzzle pieces together against the clock). We finally figured out a time and place we could meet. Shams and I came via public transit. Jilly Be, unfortunately needed to drive. San Francisco is one big construction zone; we are in the middle of high tourist season. Add the music festival, and she spent 15 minutes traversing one block in the car. Moreover, I popped into the Asian Art Museum of SF before the meet-up and suggested to Jilly Be that she park in the (normally reasonably priced) municipal lot under the UN Plaza. $15 flat rate special event parking that evening. Gulp. I'm really sorry about that. Send me your snailmail address and I'll mail you some special fabric to compensate. If you visit the Asian right now, you can see selections from the art collections of universally reviled CEO, Larry Ellison, and universally beloved CEO, Lloyd Cotsen. I have to admit to having a bit of a crush on Cotsen and a fascination with Ellison. Cotsen's collection is fantastic and Ellison has some good stuff, too. If you are in SF, I hope you can schedule some time to visit the museum. Since Jilly Be had already paid for parking all night, I suggested we visit the nearby and recently gentrified Hayes Valley. I've been visiting Hayes since the 1980s, when it was just crack addicts, Richard Hilkert Books, Vorpal Gallery and intrepid/stupid people like me. People couldn't believe I walked alone in that neighborhood. Hayes Valley is currently lined with upscale clothing boutiques where you can see the latest from local, Belgian and Japanese designers. I especially enjoy MAC, which stocks a large range of Dries Van Noten clothing amongst other lesser-known, but equally talented designers. Jilly Be and I shopped until Shams finished work and could meet up with us. Four hours flew by while we chatted, ate and drank at Caffe Delle Stelle on the corner of Hayes and Gough. 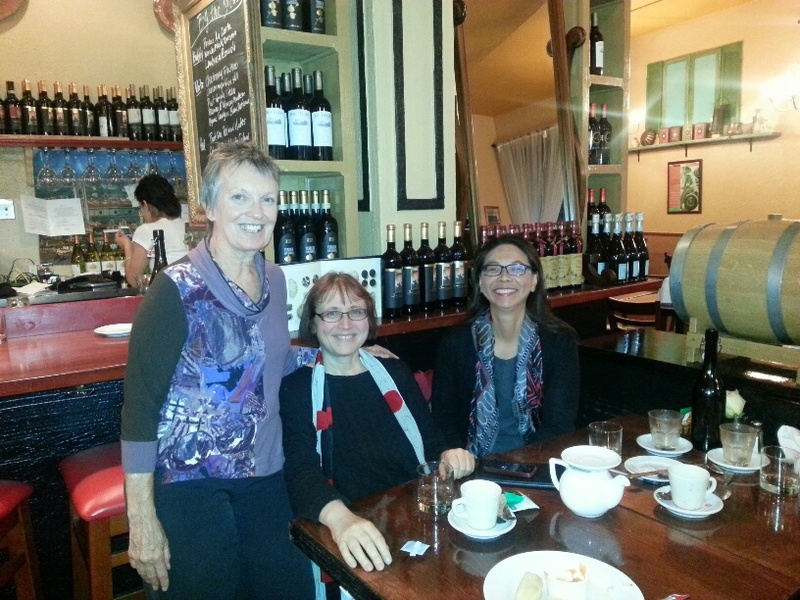 It was fabulous to spend time with like-minded individuals. I'll be back. I just can't watch movies or TV shows purportedly about scientists and mathematicians. They get us so wrong, I can't bear it. There ought to be an anti-defamation league to look after our pop culture image. OTOH, perhaps it is better that Hollywood doesn't know about the really wild parties with mathematicians and theoretical physicists, especially ones involving Russians. OMG, tell my mom that, as soon as I learned what goes on at those, I went home immediately. Emboldened by my past success with the top from Vogue 1020 and inspired by Trena's gorgeous striped version, I decided to make my own. Front, back and side. No makeup. Hair pulled back with a clip. I am amazed I found time last month to make this dress. I have little energy left to write about it. Just look at my old review, Vogue Pattern Magic. It's the same, but longer. Can you tell I am proud of the stripe matching? Cotton/lycra jersey from SAS Fabrics. Silk selvedge used as stay tape. A banded neckline instead of the turned under and stitched one in the pattern instructions. Double needle hems. Vilene fusible tape to reinforce the shoulder line. My first experience with Vilene and I can already tell that we will have a long and wonderful relationship. In real life, it's blue/gray with black stripes. I bought a black Eileen Fisher linen cardigan that completes the outfit. I like it. Bad Dad loves it. It's just interesting enough not to bore me, but it doesn't scream "look at me". I feel so comfortable in this, I'm willing to post au naturale photos of me .and. my daughter's room. OK, I did crop out some of the mess. I previously mentioned in LACMA Summer Evenings that we enjoy eating in Little Ethiopia before or after visiting LACMA galleries. There is something about eating with our hands brings out the kid in all of us. If you have to endure this kind of traffic where Fairfax Avenue compresses from two down to one lane, then why not stop for refreshment midway? Fairfax used to be an orthodox Jewish neighborhood. Many Ashkenazi (European Jewry like my in-laws) congregations sponsored Ethiopian Jews for immigration and shared this area. 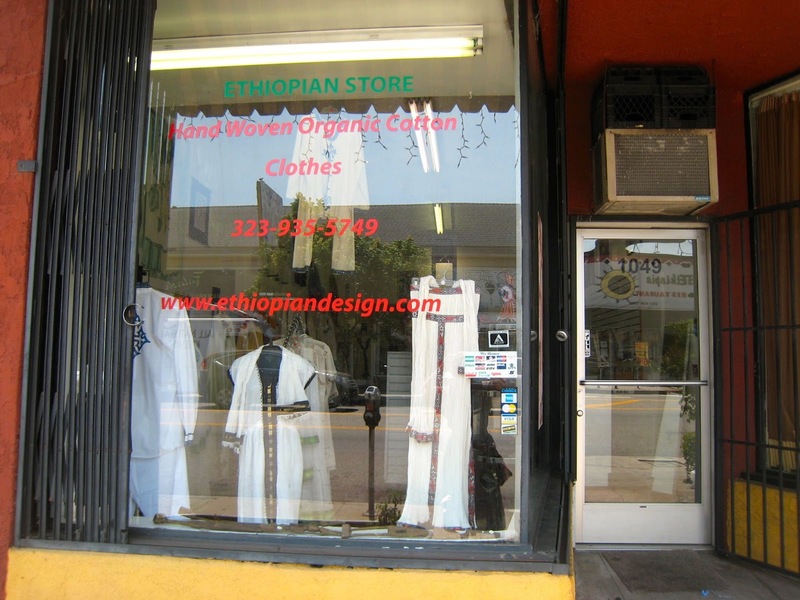 As the Ashkenazi moved westward and northward, Ethiopian businesses sprung up to fill the storefronts here. 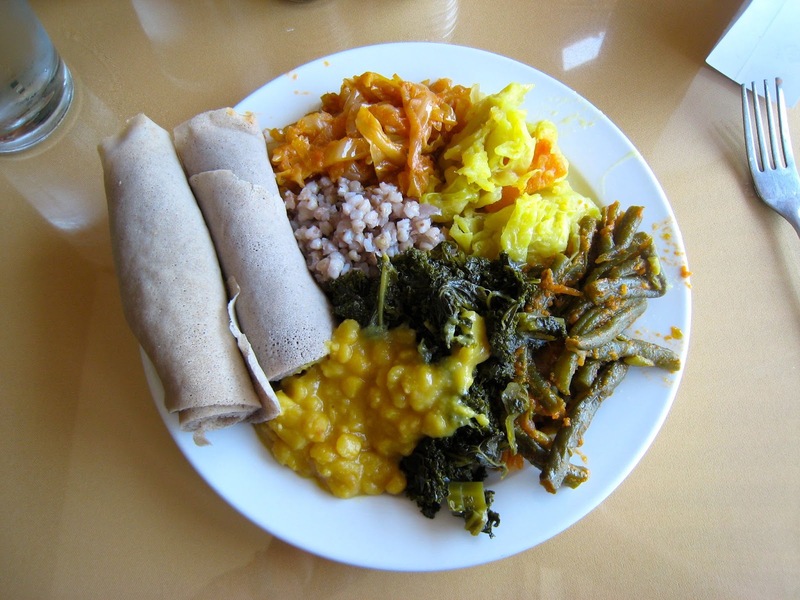 Orthodox Ethiopian Jews eat vegan on ritual days. 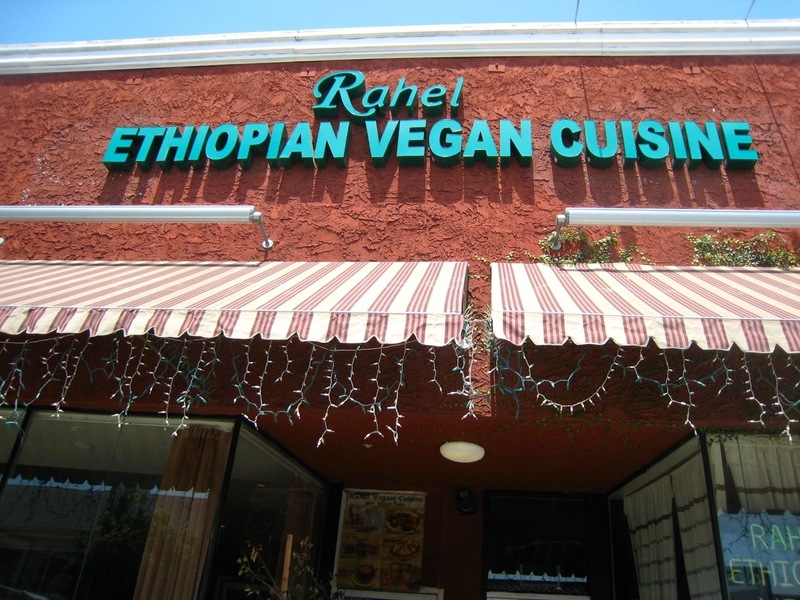 But you don't have to wait to sample it; Rahel serves vegan food every day. We are not vegan. But, given a tasty alternative, we prefer to eat lower down the food chain. This is one of our family's favorite restaurants in Los Angeles. If you didn't tell someone that the food is vegan here, I don't think they would notice the absence of dead animals. Before eating family-style with your hands, you .must. wash your hands thoroughly with soap and hot water. 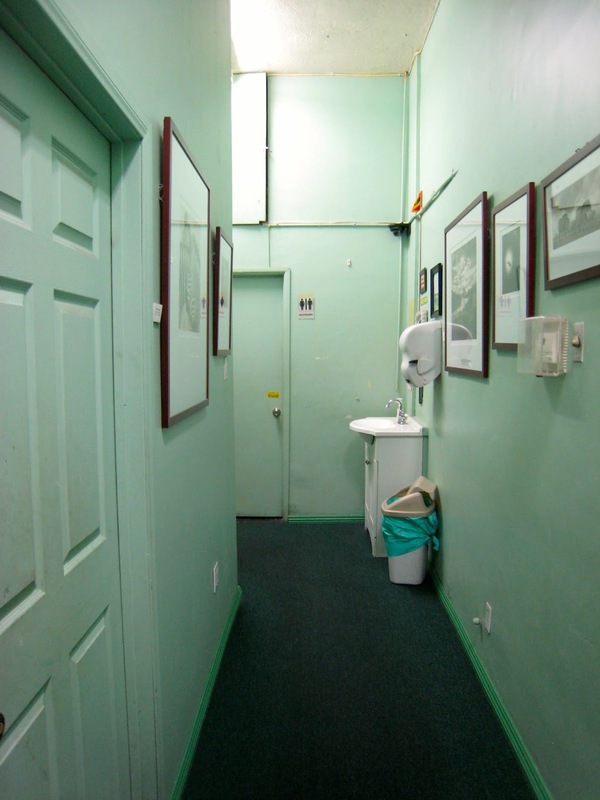 Rahel's hallway and dining room walls are lined with artwork by friends of the owner's. Prices are marked (and quite reasonable). 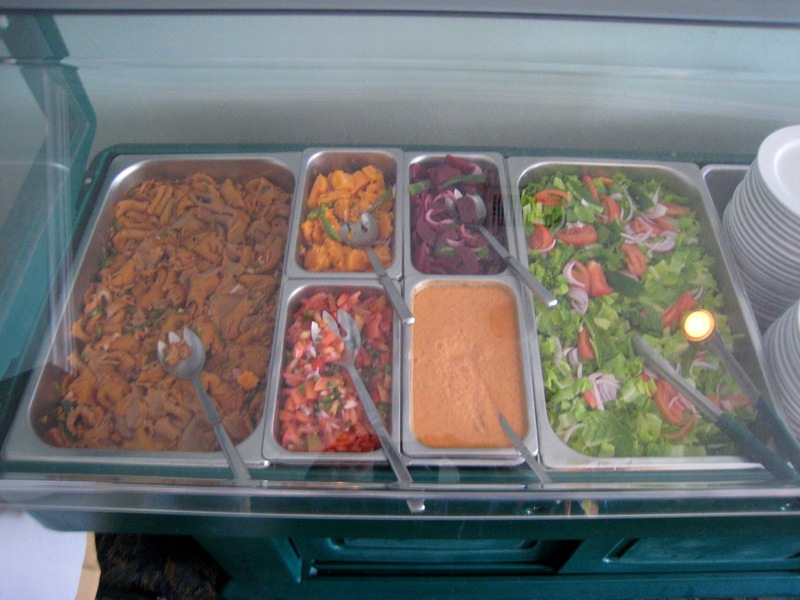 We start by sampling the salads. Then we return with a clean plate for the hot entrees, which we eat with injera. 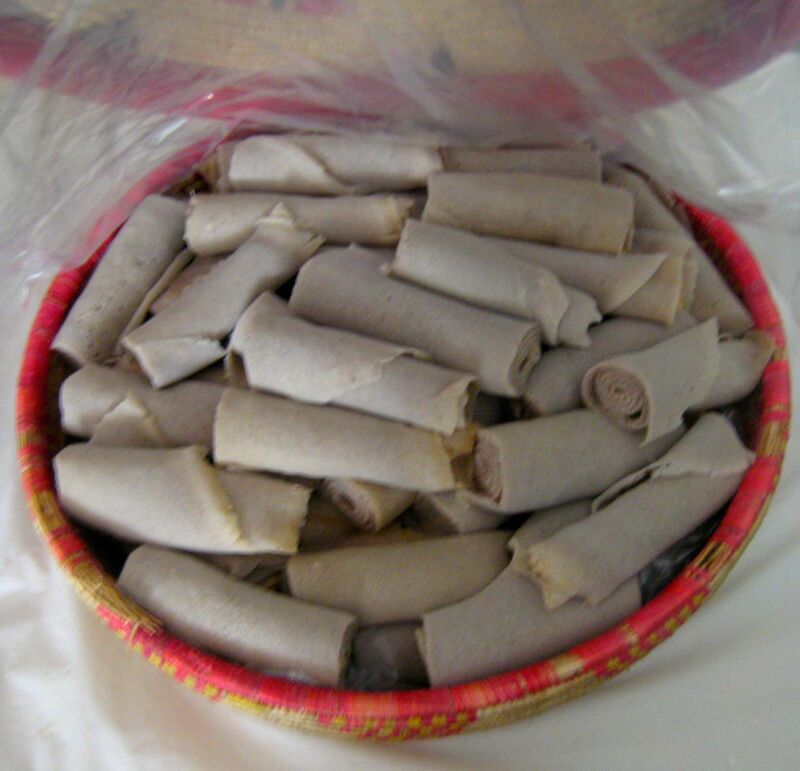 Injera is a type of bread made with teff flour, which is difficult to source outside of Ethiopia. Consequently, most restaurants in America stretch it out 50/50 with wheat flour. However, 100% teff injera is available upon request at Rahel. After stuffing ourselves, I like to shop for (what else?) textiles. Iris enjoys the thrift shops, especially the vintage jewelry. We have also had fun purchasing CDs of world music. I drove my mom around San Francisco yesterday to run errands. We stopped by Fabrix on the corner of 2nd and Clement street (aka SF's real chinatown). The ladies who work at Fabrix want you to come in and help them clear out the rolls before the fire marshall shuts them down. There is fabric stacked everywhere, even in the aisles and on the cutting table. While I was there, they joked about how their boss, Bruce, is persona non grata because they were barely able to clear the fabric he stacked on the cutting table in his last trip, and he was on the way with another load. Satin Moon is one block away, at 44 Clement street. We ate 0.2 mi away at Taiwan Restaurant, where you can experience real Taiwanese snacks (dumplings, street snack food and meals). While you are there, drop by Green Apple Books, one of the finest independent bookstores anywhere. The storefront picture does not indicate its true size. GAB has an odd configuration of two narrow street-level storefronts (with another store in the middle) and a contiguous second story that covers all three stores. 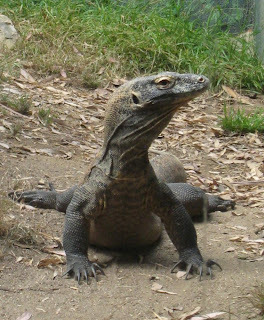 To prove that we do know how to dress appropriately, I want to show some pictures of our visit to the LA Zoo before freezing our buns off at the foggy Getty Center. Many people are not aware of the obscene amounts of money spent throwing children's birthday parties among the upper middle class and rich. It's hard to go against the tide. 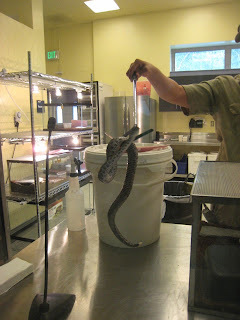 But, we have a friend who did the math and figured out it was much better value to donate the same amount of money to the LA Zoo and then use the private tours as a birthday party substitute. 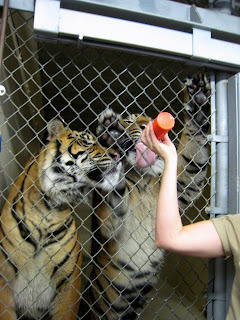 It's a much better use of money because his donation helps other people's kids (school tour groups) attend the zoo for free. I especially enjoyed seeing the Komodo dragons before the arrival of the usual Saturday crowds. The highlight was a private meeting with the twin adolescent tigers. Close enough encounter for you? 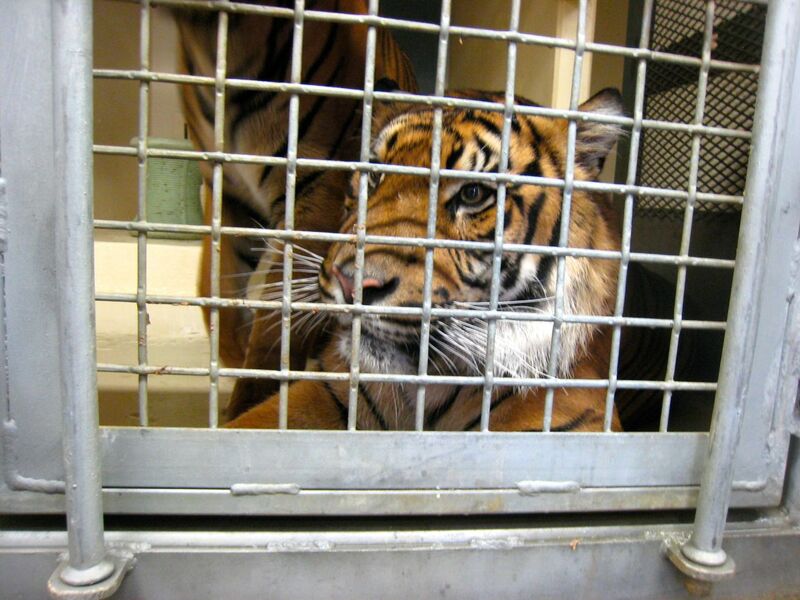 I learned firsthand how quick and silent they could be when I leaned in to see a plaything, a yoga ball, while they were in an adjacent cage. 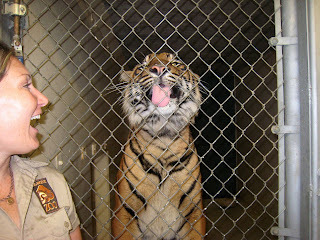 The smaller and normally less aggressive tiger ran through the gate between the cages and charged to force me to back off. Once I stepped back, he became quite mellow. 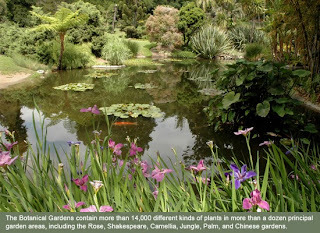 One of my favorite summer delights is the Huntington Library and Gardens Summer Evenings. Gardens open for members only 5:30 to 8:00. Bring your own picnic or order one of theirs. Lay your blanket out on the great lawn to enjoy a free concert. The kids dance spontaneously on the lawn, the paths, and any open spot. Cuteness overload. Alternatively, find a quiet corner elsewhere and enjoy the balmy, but comfortable temperatures of summertime in Pasadena. 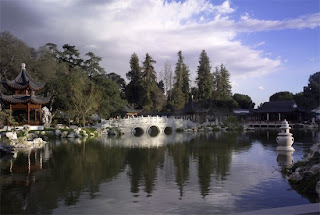 We like to hike over to the Chinese gardens and sit on the deck overlooking the water. We can usually find an open table. Sometimes, groups have to share tables (and exchange home-made picnic fare). It's all fun and friendly. Kids run around the lake. Koi cruise up, hoping for some food. Dusk at the lake with the mountains in the background is magical. Iris and I bring sketchbooks and watercolor pencils and attempt to capture the scenery. Just bring the bug repellant and you will have a great time. The remaining Summer Evenings for 2013 are Aug 4 and Aug 19. Reserve your parking pass ASAP. Membership levels begin at $120/year. It's worth it if, like me, you enjoy watching gardens change with the seasons. I take out of town visitors there often and their jaws drop when they see and experience it. The art collection is impressive. We love the history of science hall. Pennamite was awarded access to their research library and I might apply for access as well. I am interested in studying their history of science materials with an eye to writing about them here. Right now, they are featuring a show on textile arts from Californian collections! All photos courtesy of http://www.huntington.org/. Who knew the internet would lead to this? Many, many years ago, a stranger from Australia left a comment telling me that I was mistaken and included a link to updated data to contradict my opinion. She did it in such a pleasant way, and the research article she referred me to was so well-done, that I emailed her back my thanks. 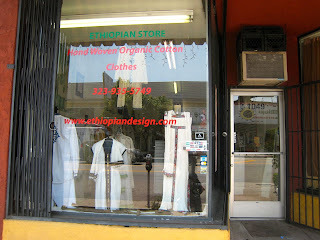 We kept in touch via email and our blogs over the years. I learned that she earned a living as a technical writer/editor while pursuing graduate studies in medieval history. I'm a scientist with more than a casual interest in history. She was a historian with more than a casual interest in science. The Internet is a great way for people on the long tail to meet like-minded individuals. The best part is, we're similar, yet dissimilar. That way, we can learn new things from one another instead of being ditto heads (option 6) in an echo chamber. Graduate school was put on hold after she got a fantastic job opportunity. But that job abruptly ended through no fault of her own. 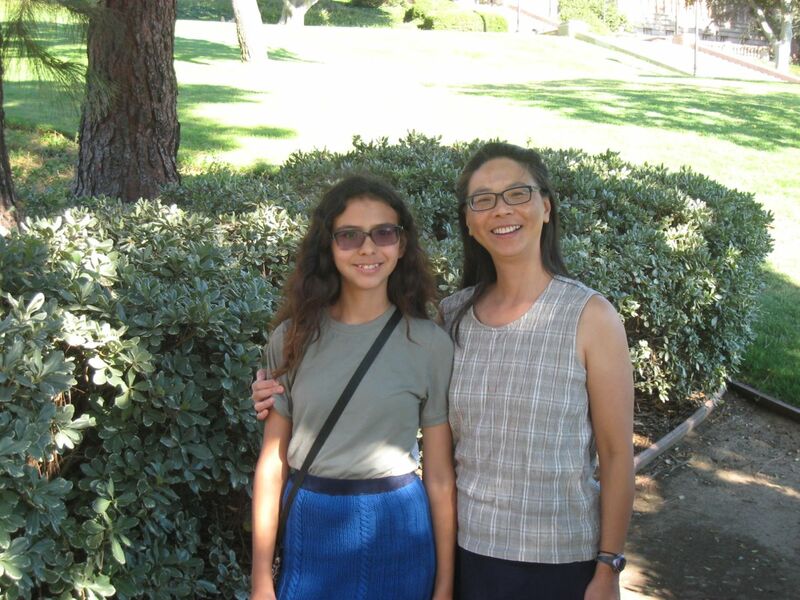 She took advantage of forced time off and accrued frequent flyer miles to tour California. This is her third visit with us. On this trip, she brought her aunt (in the safari vest), and six Style Arc patterns. She took a panorama shot of us at the Getty Center after the marine layer crept in. 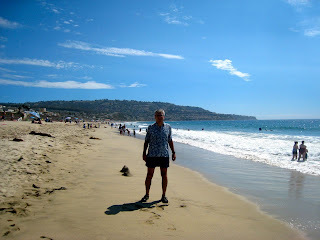 We look like typical under dressed tourists who don't know that the California coast is usually cold during the summer. 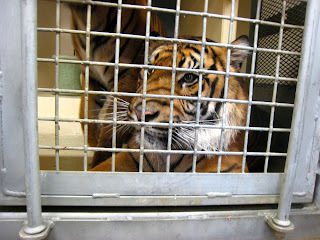 In our defence, we began the day at the inland and much warmer LA Zoo. After they toured around San Francisco, they flew to San Diego, where we picked them up and went for a drive up the coast to La Jolla. 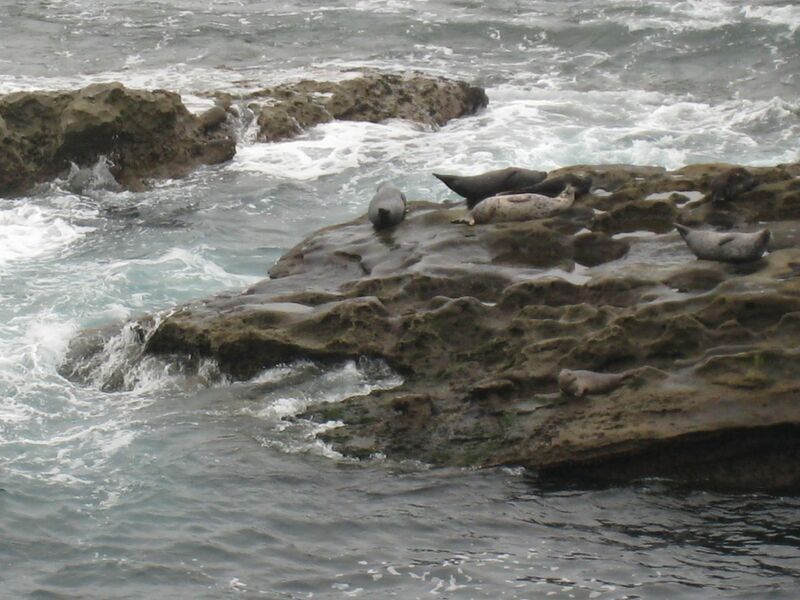 Can you tell the difference between a seal and a sea lion from this distance? I can't. But it sure was fun to see them clamber back up on the rock after swimming. Hopefully, this means she can return to blogging and we can enjoy learning from her again. Meanwhile the patterns await while I deal with some RL issues like family work, job applications, and brushing up on statistics and programming with books and MOOCs. Bad Dad asked if I mentioned that TWC (Time Warner Cable) was charging us a monthly fee for a cable modem that we didn't even have. Oops, I forgot about that particular transgression. When we started with Adelphia* prior to 2000, we rented a cable modem from them. Sometime later, we purchased our own cable modem and returned theirs. Adelphia went bankrupt and TWC/Road Runner took over our cable and internet respectively. Eventually, TWC rebranded RR as TW Internet. The entire time that we had an account with TWC, we have used our own cable modem. For most of that time, they knew that and didn't charge us modem rental fees. The bills climbed ever higher with more and more fees. Bad Dad and I have PhDs, but we are also busy people. We don't understand the purpose of every cryptic line item fee on their bills but we pay them anyway. When Bad Dad called to cancel our cable service on Tuesday, they asked us to return their modem. Bad Dad informed them that we don't have one of their modems. They asked, "then why have you been paying for rental of a cable modem for the last 6 months?" Bad Dad asked them how they decided to tack on the fee and why they obscured the $3.95/mo fee so it wasn't clear that we were paying for something we never received. He wanted the fee refunded retroactively. They went on the offensive and told him that he should have alerted them earlier. Why, after so many years, did they sneak a modem rental fee to our account when we have always provided our own modem? And, why, would they blame a customer for their own mistake? Or was it a deliberate and fraudulent attempt at revenue maximization? He got the fee refunded retroactively. We hate Time Warner Cable. * I have some real horror stories about Adelphia customer service. I would have gone after them for the malicious damage by one of their service guys, but Adelphia collapsed due to mismanagement and outright fraud in the tech bubble.